This flour is a distinctive coral red colour, more intense in parts. It has a characteristic slightly spicy fragrance and flavour. Thanks to its tonic and antiseptic action, it stimulates the digestive system, easing digestion and strengthening the circulation. Rich in vitamins E, B, C, K and betacarotene. Type ‘0’ soft wheat flour, powdered paprika. Boiled potatoes, chicken steak, lettuce and buffalo milk mozzarella. This product has a distinctive intense green colour, mature hazelnut fragrance and ample flavour, showing its strong personality. This intense ochre yellow flour has a distinctive pungent and acerbic fragrance. It has a sweet, highly aromatic flavour. This flour is amber in colour and rough to the touch. This flour is stone-ground, and retains the fragrance and flavour of hand-worked flours. 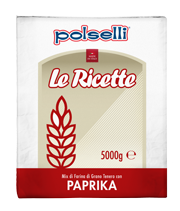 This flour is characterised by its dark greyish colour and ash fragrance.